For more than a century, Shin Buddhists in the United States have sung gatha (hymns) set to Western-style music, often accompanied by piano or organ, during weekly Dharma Family Services. These songs have a long and colorful history in the US, a history that is not often discussed in the academic literature on American or Western Buddhism. Songs sung include updated versions of traditional Japanese folk songs, Shinran Shonin’s devotional poems (wasan), and modern compositions by life-long and convert Buddhists alike. 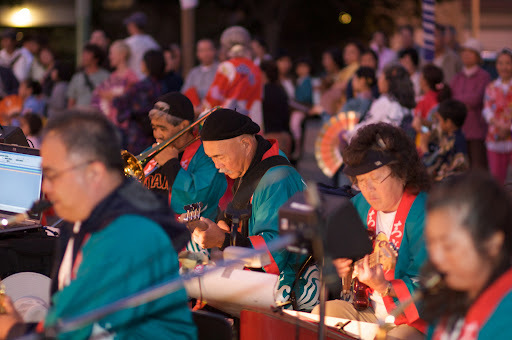 In a very general sense, I’m interested in the types of music being composed, performed, and played within US Shin Buddhist communities today, who’s making this music, and why. My long-term goal is to write a book on the subject which will focus primarily (though not exclusively) on music performed as practice during Shin Buddhist rituals, services, and celebrations. I am curious about the place of music-as-practice within the borader context of Shin Buddhist ritual/practice life. How does music making compare to, say, reciting the nembutsu, reading a book about Buddhism, mediation, or hearing a Dharma talk? Furthermore, are US Shin Buddhist musical practices local in nature or do they travel across the country? In what ways has the music of Jane Imamura, for example, helped shape a shared sense of belonging among Shin Buddhists across North America? These are some of the big questions I’ll be asking over the coming year as I research this topic, interview music makers, and survey members of Shin Buddhist communities about their musical and practice lives. This site will chronicle this work as well as act as a repository for information I pick up along the way. You can help by either taking the survey or, if you don’t necessarily identify as Shin Buddhist, then help publicize this project. In either case, thank you for reading this far and I hope you’ll also help spread the word of this exciting project. Trying to find some of the music to listen to (aside from YouTube). Would be nice in mp3 format on Amazon . Like to listen to the tunes and sing along with the service book at home.